The wedding ring a man chooses should fit with his lifestyle, personality, and personal style. A tungsten metal wedding ring is a popular choice, especially for young couples that want to stand out. This metal is modern and understated, but is it right for you? Tungsten is a metal with one of the highest melting points and tensile strengths. Tungsten rings are made by combining the tungsten with carbon to form the alloy tungsten carbide. This alloy is one of the hardest used in jewelry. Why should you choose men’s tungsten wedding rings? Men’s tungsten wedding rings are durable. Tungsten is incredibly durable and highly resistant to scratches, so it fits well with men living an active lifestyle. In fact, men’s wedding bands in tungsten are more durable than gold, palladium, silver, and platinum bands. Tungsten is affordable. Generally, these rings are priced lower than gold or platinum bands, but higher than titanium or stainless steel. 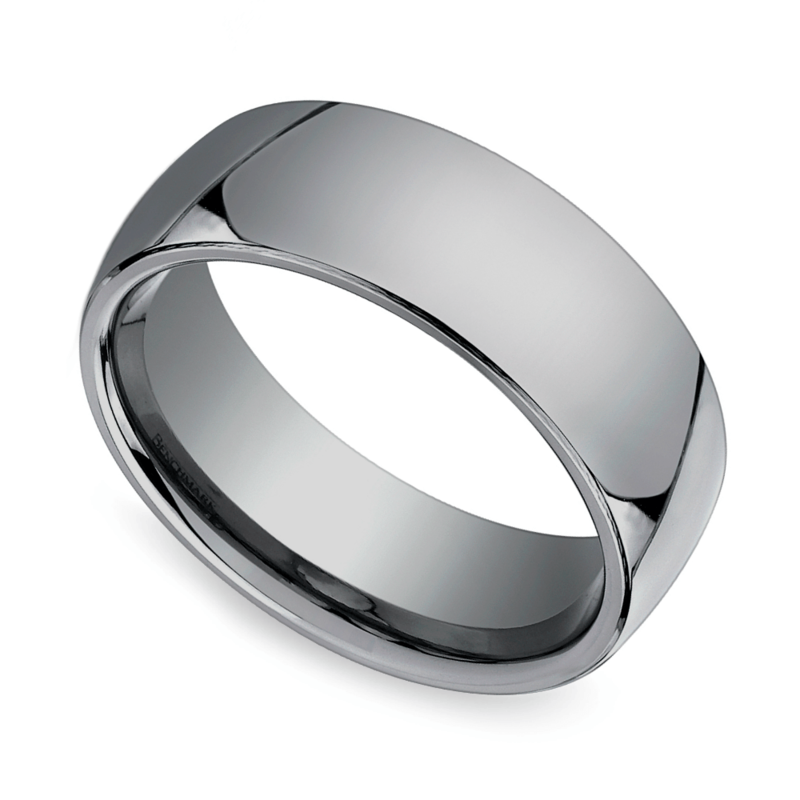 With tungsten, men get the sleek, sophisticated look of platinum with a much smaller price tag. There are a variety of finishes. With men’s tungsten wedding rings, there are a number of finishes to choose from. Men can opt for a classic polished mirror finish or a toned down, darker gray brush finish. 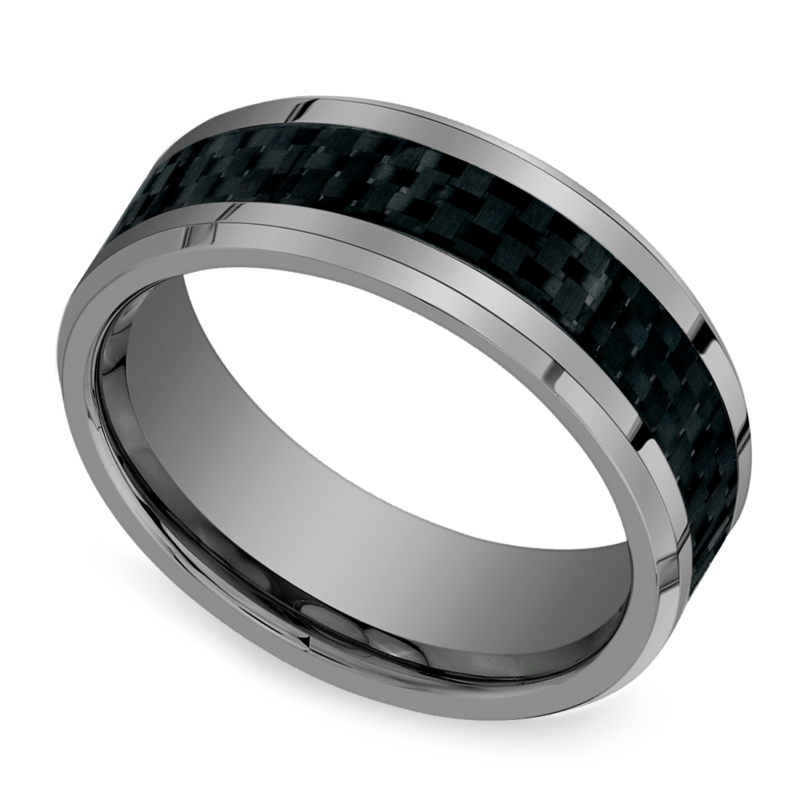 For edgier grooms, there are even black tungsten band options with a hammered finish to add texture and interest. With any of these tungsten finishes, men will have a timeless piece of jewelry that will last a lifetime. Tungsten does not tarnish or rust. Over time, sterling silver will tarnish, titanium will form a blue patina, and stainless steel will rust. With all three of these metals, men will either have to have the ring professionally cleaned or take care of it on their own. However, tungsten holds up over time and requires little maintenance when compared to other metals. No matter how many years you wear tungsten, or what conditions you put it under, it will not age the same way as other metals. Get a warranty. Tungsten is known to be durable and long lasting, but it is not impervious, so you should always ask your jeweler for a lifetime warranty. Be sure of the size. Tungsten cannot be sized easily, if at all, so you must be certain that you have the correct size during the time of purchase. If you plan on purchasing the tungsten band online, be sure to have your finger professionally sized before doing so. If you’re unsure of the size but set on buying it, double check the jeweler’s return policy so you can exchange the ring if needed. Get the right metal. There’s a difference between industrial tungsten and jewelry grade tungsten, so be sure to visit a jeweler who has the right kind of metal. Brilliance, a leading online jewelry retailer, offers a fair selection of men’s tungsten wedding rings. With a variety of different finishes and detailing, Brilliance has the perfect tungsten wedding ring for every man.